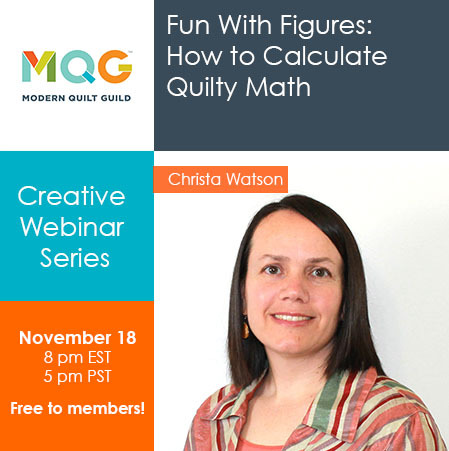 My current WIP is a live online webinar I will presenting for the Modern Quilt Guild on November 18th titled Fun With Figures: How to Calculate Quilty Math. As part of the webinar, I’d like to ask for your help in my preparations. What are some problems you face when it comes to calculating yardage? Or what do you need the most help with when figuring out fabric requirements? I’d love to tailor this lecture to my audience and will trouble shoot as many of your suggestion as I can. You can just leave me a comment below, or email me directly (to christa@christaquilts.com). Christa’s Soapbox – The Only One Standing in My Way is Me. I’m wondering if there is any math formula for a square in a square block. For instance, if I want a 6 inch finished block, what size do I cut that centre square? And what size do I cut the squares to cut in half square triangles to go around that centre square? Thanks Christa. I just found your blog when I registered for the webinar. I’m looking forwards to lots of good math! When a block is subdivided I get confused about how to calculate the cut size of the smaller pieces with the quarter inch seam allowance. For example, to end up with a six inch finished nine patch, how do you figure out what size to cut each of the nine squares? Adding a couple of triangles to a block is even more difficult for me to figure out what to allow for seam allowances when designing a block. You are amazing. .just had a problem this week. Triangles that have a fraction . ie 6.5 or 8.5 on the bottom but measure 6 in or 8 in on the sides. Oh my. Registered as soon as I got the e-mail! So excited! I personally struggle with triangles as well and figuring the best math for them, especially when wanting to do anything other than equilateral triangles. Other than that, being able to scale a good pattern down to or up to your liking, other than just continuing with borders or adding more ‘blocks’ of what you’ve done. Another recent one, is circles. When working with a circle over a circle, adding ‘height’ to it as well (a strip around the circle, but not making the circle larger, giving it the ‘full’ effect), how to you get it to not pucker when sewing on the bottom piece? Whether I have compensated for the 1/2” seam allowance or not, it continues to pucker. Can’t wait for the class! How to figure set in triangles…..
I’d like to know how to convert yardage when the directions tell you to cut square down to triangles but I want to use thangles instead. Make sense? How do you adjust yardage to take advantage of new techniques? I often have a conceptual “I want a FQB or JR to get a lot of different colors or prints in this quilt, but there’s a ton of left overs” issue. I’m not sure this can be fixed. Are there any charts you know of to assist in resizing up or down. How much should we allow for FMQ “shrinking” in our quilts. What a great topic for Quilting math! I have trouble figuring out how to figure out my backing yardage split so I have the correct size for my quilt. Here are a couple of things I’d be interested in knowing about how pattern writers handle yardage requirements. 1. When you write a pattern, do you calculate yardage to allow for shrinkage if the fabric is prewashed before cutting? And how much extra do you allow? 2. Sometimes I know I can make 1/2 yard work but feel the pattern specs should call for 3/4yd to be safe. How do you handle this sort of thing. When I try and resize a pattern with half squares and quarter squares I am unsure how big to make the squares.